Unprecedented genomic features of microbial communities exist in serpentinite-hosted hyperalkaline springs originated from mantle rocks -- a study led by Shino Suzuki at the Kochi Institute for Core Sample Research of Japan Agency for Marine-Earth Science and Technology (JAMSTEC: Asahiko Taira, President) reported. The project was carried out in collaboration with J. Craig Venter Institute, University of Southern California, Memorial University of Newfoundland and Delft University of Technology. Samples were collected at The Cedars in northern California in 2011 and 2012. The Cedars is a site of active serpentinization, in which water reacts with ultramafic mantle rock such as peridotite to produce a new suite of minerals including serpentine, ultra-basic fluid, molecular hydrogen, and, under some conditions, reduced carbon in the form of methane. It also discharges high alkaline fluids of pH11 or above. As such settings are likely to have been common on early Earth, serpentinizing environments have been implicated as locations that may have supported early microbial life. 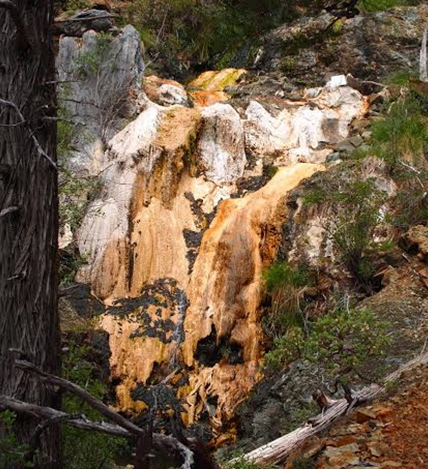 Based on microbiological and metagenomic analysis of these samples, the scientists found that the deep-water fed spring in harsh ultra-basic geological settings of The Cedars contains one of the most unusual communities ever reported. Specifically, their analyses of metagenomes and draft genomes from this spring identified extremely small genomes among the smallest ever reported except for intracellular symbiosis. In addition although the microbial community in the deep-water fed spring was dominated by bacteria, the metagenomes and the draft genomes contain no bacteria-type ATPase genes; they either have an archaeal type ATPase, from diverse sources, or no recognizable ATPase at all. This is a notable and unprecedented distribution of this group of ancient and highly conserved enzymes. Factors of this unprecedented microbial community are not attributed to pH because a nearby spring fed by shallow water at The Cedars hosts an alkaliphilic community. In the deep-water from The Cedars, most-dominantly detected type of microorganisms was in a taxonomic group of Candidate Phyla Radiation (CPR), which include enigmatic lives; being very small in both cell and genome size and lacking a number of genes needed for independent life. Their life strategy is still unknown; however, according to the scientists' analysis of genome replication rates, these CRP bacteria seems to be actively performing genome replication in the ground-water environments associated with serpentinization. These cells are aggregating on mineral particle-like structures which have a similar elemental composition in the group of serpentinite or peridotite minerals. 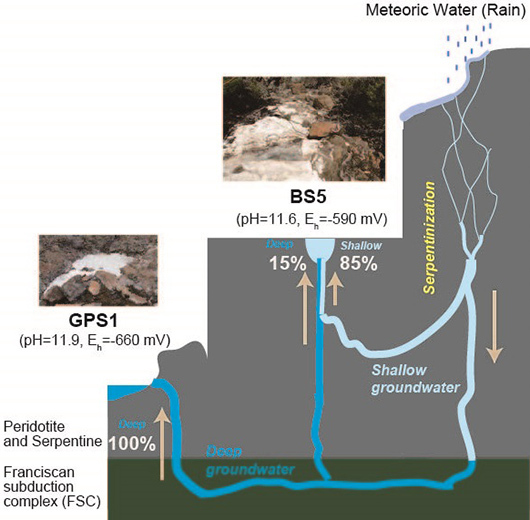 These findings indicate that serpentinization-fed spring may provide an important clue to understanding of the evolution of genes, genomes, microorganisms and communities in deep subsurface environments and also mystery of early life on Earth. This work was supported by KAKENHI (Grants-in-Aid for Scientific Research) 26106004,16K14647,15H06907,2625104 and 15K14907 by the Japan Society for the Promotion of Science (JSPS) and the US National Science Foundation. The above results were published in ISME Journal on July 21, 2017 (JST). Figure 1. One of serpentinite springs in The Cedras. White-colored areas are calcium carbonate crystals. Arrows show the direction of water flow. The percentages indicate the fraction of deep or shallow source at each spring. Colored circles indicate clusters of individual bin-genomes. Bin-genomes were identified using the estimated taxonomic classification (color of dots), length (size of dots), Guanine-cytosine (GC) content and mean coverage of contigs. 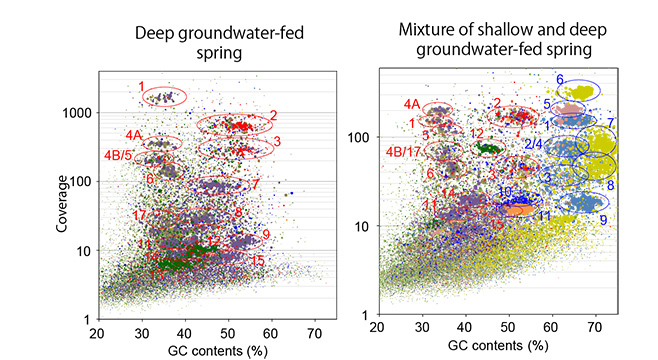 Colors of the circles denote groundwater sources where the bin-genomes are associated, i.e. red circles show the deep members, while blue circles show the shallow member. A & B: Detection of Parcubacteria organisms, a type of CPR bacteria (green fluorescence), which makes aggregates in the mineral particles. C-I: Detection of presence of Ca (C), Si (D), Fe (E), Mg (F), Cl (G), Na (H) and Cu (I) in the object that contains CPR organisms. They showed strong reaction to Si, Fe and Mg, indicating that these micro minerals are serpentinite or peridotite minerals.